I have been looking for a lot of time for a program like MSN Webcam Recorder. When I had it I felt really disappointed as it wasn’t compatible with my WIFI network adapter. Why? It didn’t work with WinpCap, the traffic monitor libraries that uses the program. You need to create a bridge between the adapter used to connect to the Internet and another adapter (doesn’t matter if real or virtual). After that, you must just capture the adapter traffic, as it is the same that the traffic in your WIFI card. 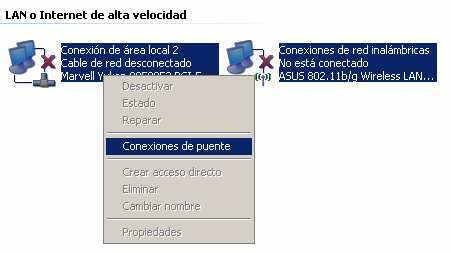 Now, selecting two adapters, right click and select “bridge connection”. If your wlan get disconnected, don’t worry. You can surely reconnect again. If you continue experiencing problems, a possible solution would be disable Zero Byte from services and trying to use your vendor released wifi application. Now your new bridge adapter appears at the list from the MSN Webcam Recorder and you can start recording videos from your contacts.